About ten years ago I was gifted a set of studio strobes from a friend of mine who was closing her photography studio. I had always wanted to learn lighting, but looking at the strobe heads and soft boxes just stress me out. It seemed hard and technical and not "my style". So I told myself that lighting just wasn't for me, put the entire set up in storage and left it there for five years. During that time, I struggled with light. You see, I live in Seattle, and it's dark here a majority of the time. When I was shooting digitally, I would just crank my ISO up to 6400 and make it work. But when I made the switch back to film I knew something had to change. If I was going to shoot film inside, in Seattle, I was going to have to learn how to use lighting. So I did. And it changed everything. Since then I've become somewhat of an off camera lighting evangelist. I sing it's praises every chance I get! And every time I talk about it I hear the same reasons from photographers on why they don't want to use it. So today I want to talk about the three myths that keep photographers form using off camera lighting and why they are just not true. I used to think this too. But it's not. In fact, it's really, really easy. Just force yourself to start. Take your strobe or your flash, put it on a tripod, put a light modifier on it, and tell yourself it's a window. 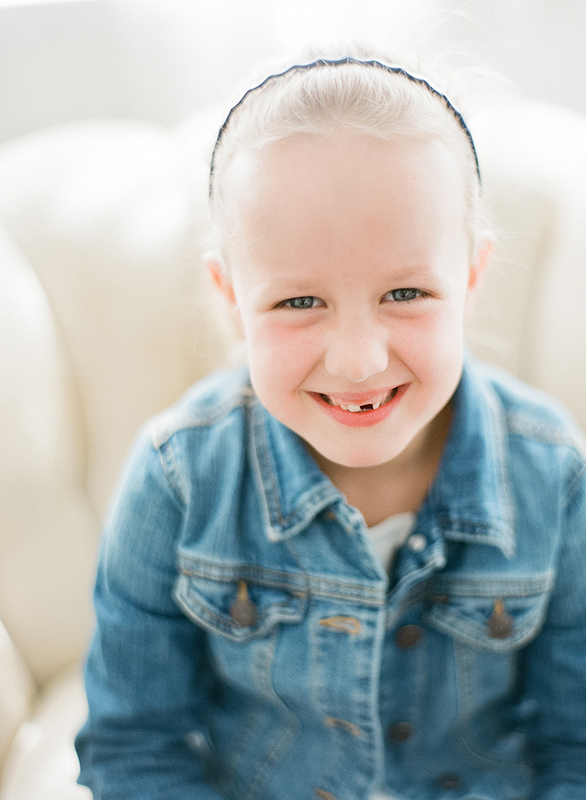 If you can do it with the sun shining through a window, you can do it with a bulb shining through a soft box! This was my biggest worry what kept me from using lights for year. You see, I work with kids. And kids run and jump and move a lot. I wanted to be able to capture that movement. And I can. In fact, strobes make it better! The flash freezes movement, so you can capture a kid in mid jump and not get motion blur! Myth #3: Lighting looks fake. I want soft and natural. This is the biggest lighting myth around. Lighting, when done right, can look as soft and beautiful as natural light. I turn my lights down until I get a reading of F4 in the shadows. That way I can soot at F4 or even F2.8 and have a prefectly exposed image that looks soft and just like natural light. Not sure how to meter with strobes and flash, check out my FREE guide on metering in all kinds of light! Pro Tip: If you are going to be shooting with off camera lighting be sure to check your camera's sync speed. The sync speed is the fasted shutter speed recommend for your camera when working with a flash of any kind! For a little over a year now, I have been obsessed with shooting Rolleiflex in studio with strobes. A few weeks ago after I shared some Rolleiflex images, I received a question from a reader asking about how I sync my strobes with to the Rolleiflex. Click the video below to see my reply! Do have a question about using lighting with film cameras? Feel free to ask in the comments below. I'll be sure to answer! When I started using strobes it was out of desperation. I wanted a way to be able to shoot film through the winter. Thats it. It was intended as a temporary fix to get me through to the spring. And then something unexpected happened. When spring finally came around, I found that I liked using my strobes more than I liked using natural light. Crazy right? Well maybe not... here's the thing. Strobes are consistent. When I use them, my light is the same at every. single. shoot. My meter readings are always the same, regardless of the weather. Using artificial light has allowed me to shoot film 100% of the time and has freed me from stress. Strobes bring out the best in film. Film loves light. And strobes give the perfect amount of light every time. So my images are always perfectly exposed and beautiful. Strobes do not have to look "flashy". I love strobes, but I HATE images that look artificial and "flashy". I want my work to be soft and airy and, when used properly, my strobes give me that look. Strobes are easy. Seriously. I know that they seem complicated, but they are not. Everything I do is done with one light and one light modifier. Thats it. I encourage you to give off camera lighting a try... and stay tuned, I'll be sharing a series of post here to tell you just how to do it step by step. It's not hard, and it will absolutely change the way you shoot film, for the better! If you can't wait and just want to dive into off camera lighting right now, check out The Missing Link: A Film Photographer's Guide To Off Camera Light. It's is a complete how-to... everything from what equipment you need to lighting set-ups- full of text, diagrams and video tutorials! You know I love answering questions that I get online, and this question came in from one of my followers on social media last week. She asked: "How high should my modifier be from my subject"
Almost every single photo I take these days was captured on film, using strobes. When I started using studio lighting several years ago, it was really just a way to make it through the dark days of winter. Now I use them all the time. Studio lighting has allowed me to shoot film all year long. It has given consistency to my work, helped me define my style and build my brand. I couldn't do what I do without it! 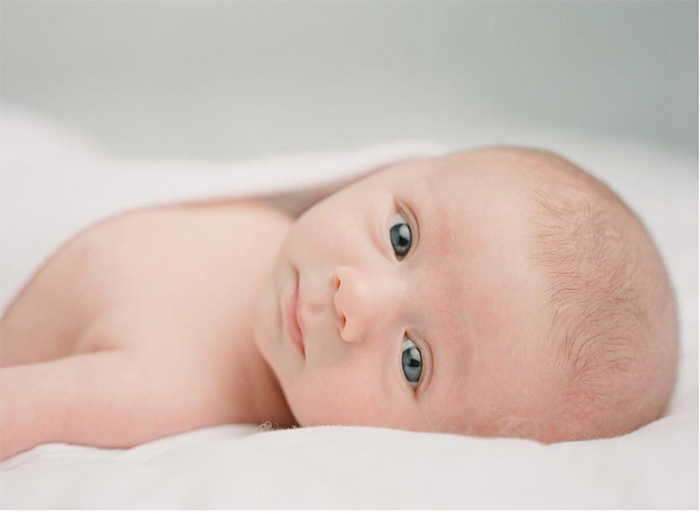 I'm often asked how I set up my strobes during newborn shoots. So at my newborn session this morning, I decided to step back and snap a quick photo of my set up. This is my typical set up for photographing newborns and toddlers on my white bed. Please let me know if you have any questions about shooting film with studio lighting. Learn Off Camera Lighting here! Sandra Coan: Strobes and Film! Last week on Facebook, I asked photographers who shoot film with studio lights to share their images on Instagram using #strobesandfilm. I have to say... the work that popped up in my feed as a result blew me away! Film loves light! And studio lights and film together are just a match made in heaven. Check out what these amazing artist are creating. Do you use studio lighting and film together? If you do, we want to see! Use the tag #strobesandfilm for a chance to be featured. And if you want to learn how to use strobes and film, click the link below! Start learning how to use light today! It has finally happened. After months and months of shooting nothing but film with strobes, I've come to the point where I think I prefer the look of strobes over natural light. Are you interested in learning to shoot with strobes? I'd love to teach you! Sign up for my list and be the first to know about new classes! Earlier this year I released my workshop style PDF, The Missing Link: A Film Photographers Guide to Studio Strobes. My intention for the guide was to give film photographers the foundation they need to be able to shoot film 100% of the time. But what people have done with the information has truly blown me away! Think strobes are just for studio photographers? Think again! Check out what these amazing creatives are doing with artificial light. 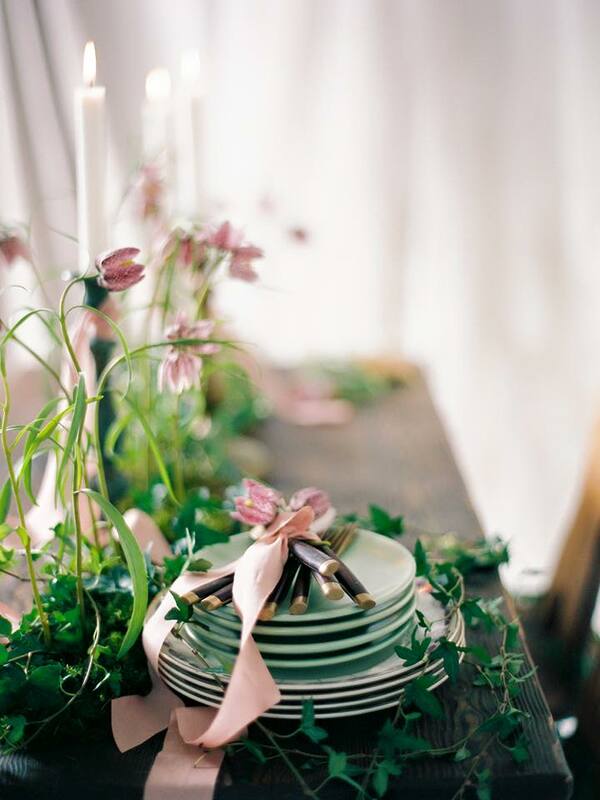 Love these detail photos by Isabelle Hesselberg of 2 Brides Photography. So stunning! 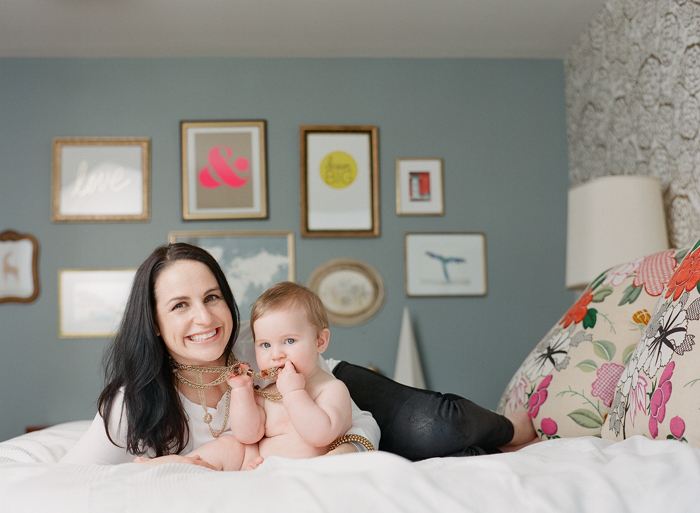 Newborns on film make me swoon. This image by Jennifer Capozzola Photography is absolute perfection! Fuji 400h. Processed and scanned by Indie Film Lab. 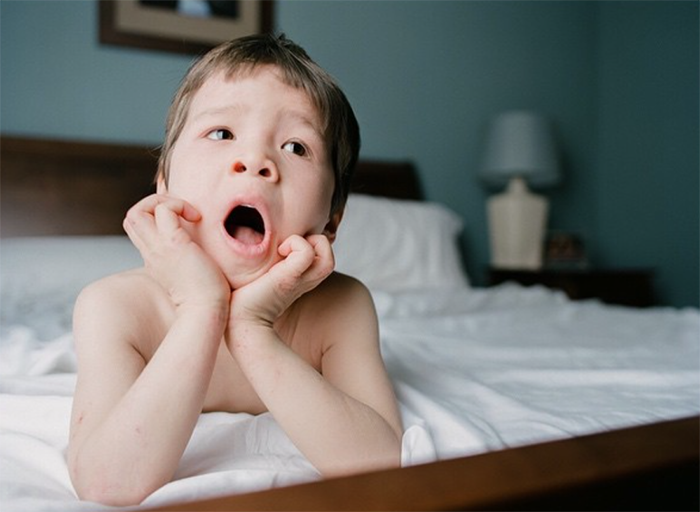 Photographer (and bravest mom in the world) Carrie Geddie ambushed her kids with this early morning lifestyle shoot. Fuji 400h. Processed and scanned by Richard Photo Lab. 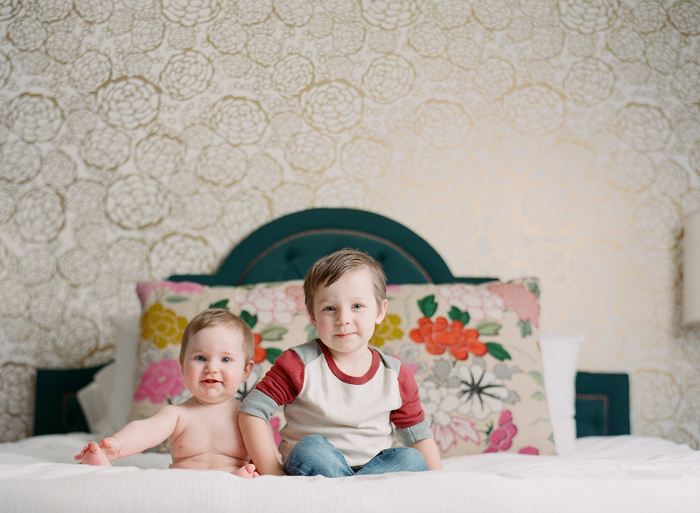 So impressed with this lifestyle photo by Jen Golay. Strobes in the bathroom! No problem! Fuji 400h. Processed and scanned by The Find Lab. And because who doesn't love a Polaroid photo of a creepy doll? Martin Garcia took this photo with strobes on an Instax Camera! So cool!! If you’ve been wanting to learn how to shoot film with strobes, now is the time! Follow this link to learn off camera lighting! My transition back into film was not a smooth one. 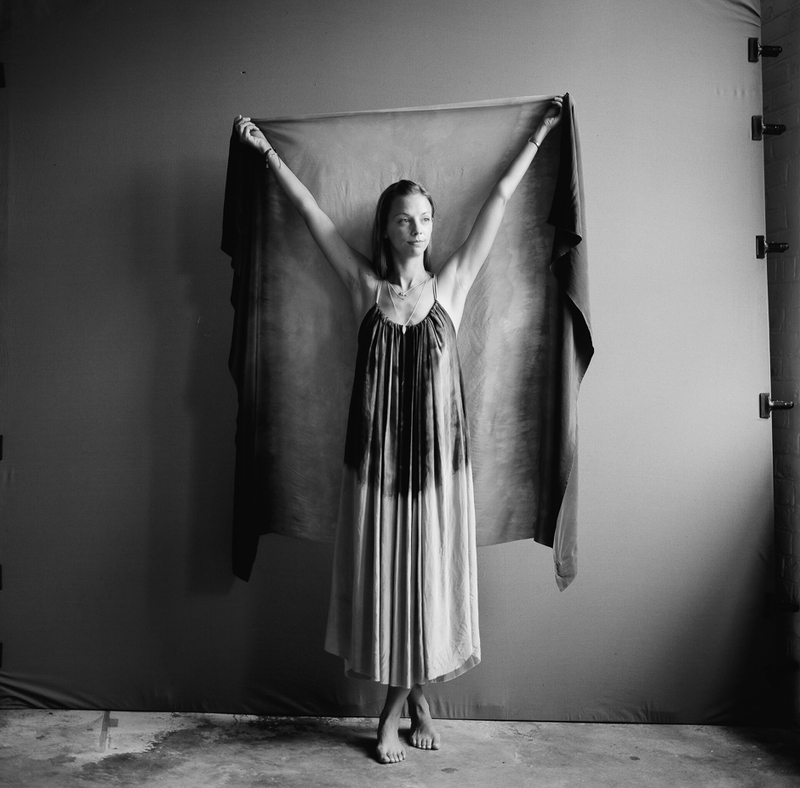 My first hurdle was figuring out indoor light, and how to make shooting film in studio work for me, even in the dark Seattle winter. In the end, learning how to use studio strobes was a life saver, and with no more fear of inadequate light, my problem was solved. The second hurdle, however, was much harder. When I was shooting digitally, my sessions were fast and fun. I could fire away without care and never felt that I was missing a moment. It was not unheard of for me to complete a family session in 20 to 30 minutes. And in the end I would have 500+ images to cull and edit. The slowness of shooting film, however, was another story. My sessions no longer had a comfortable flow. Sessions started taking longer; up to an hour, sometimes even a little more. I was constantly worried that I was missing moments. It also stressed me out that after an hour of shooting, I was walking away with only 64 images (four rolls of 120) to choose from. I went from giving my clients 100 or so images per shoot to 30 or 40. But I stuck with it. I love the look of film, and I really didn’t want to go back to my digital gear. Then, just a few weeks ago, I had a super fun session with a six year old, and four year old twins. I did my thing… pausing to talk to the parents and kids when I stopped to change rolls, and taking my time, slowly progressing through the shoot as I do now with film. At the end of the session the mom turned to me and said “thank you! that was so fun and relaxing! I can’t wait to do it again” I smiled and thought… “OMG… It WAS fun and relaxing… when did that happen?” And just like that I realized that I’d fallen into a new normal. My new normal is slow. There are pauses and down times in the sessions. I don’t rush to make sure I’m catching every. single. adorable. moment. Instead I’m trusting that when I choose to hit the shutter, something special and beautiful is going to be captured. I’ve given into the process… and I love it! Are you struggling with transitioning to film? What are your hurdles? Do you have a new normal? I’d love to hear about it! Post your comment in the space below, or join us on the Facebook Film Forum group! All images by Sandra Coan. Shot on a Contax 645 with Fuji 400h and strobes. While visiting the Rijksmuseum in Amsterdam, I was blown away by how closely Rembrandt's portraits resembled black and white film. The exhibit, Late Rembrant, featured portrait after portrait in the same, lit-from-the-side, north-light style. The man was truly talented at seeing light. Watch the video to hear a few knee-jerk first impressions on Rembrandt, north light, and his consistency in style. When I first walked into my first studio in downtown Charlottesville, Virginia back in 2009, it was love at first sight. The place was a total dump: it had been used as a mechanic's garage, a tractor rental company, and for other industrial purposes over the years. But I knew that could be fixed. It was the light I was after. So, I strapped on my work gloves and went to town. The studio had two giant windows that faced north, and was elevated on a hill. The light that entered those windows was all reflected off the surrounding sky, and was so strong that you often turned your eyes away from the windows because of the intensity. And it never changed, no matter the weather or time of day: the light was always the same. Further, anything you put in front of those windows to photograph in the midst of that north light looked dreamy and filled with aura. It was like visiting the well-kept house of an elderly woman who has had her place decorated the same way for 50 years: all of the furniture, decorations, picture frames, and people, feel like they're supposed to be there, or had been there for decades, and you just happened upon it one day. No matter how imperfect the position of the things, or the imperfections of the things themselves, the sheer length of their stay in that same place for so long renders them the "right" things in the "right" place for them to be. It is a sort of validation of the authenticity of the thing placed. That's what it was like to have a subject in that studio. After they tore the place down in 2013 to make room for a Marriott Hotel, I've been on the hunt for the same kind of light. At one point, I had access to a luxurious place with giant, south-facing windows. I placed a few white curtains over the brightly-lit industrial windows to diffuse the strong sun, but something about the light just wasn't right. What was the difference? Why was it that I couldn't recreate that north-light-glow using south light? I loved using the faster shutter speeds that the super-bright south light allowed. But the behavior of the light was so much different from my original space. So, I decided to try to answer this question by studying the difference between north and south light, starting with trying to understand the behavior of north light. Below is a meter reading diagram taken by a north-light window in our house. 1) There is a 3-stop difference between the brightest highlights and the deepest shadows. 2) The highlights dominate the light falling on the subject, therefore, most of the subject will be lit by highlights. 3) Once the light begins to fade, it seems to step down those 3 stops gradually, not abruptly. 1) There is still a 3-stop difference between the brightest highlights and the deepest shadows. 2) The highlights still dominate the light falling on the subject. 3) Once the light begins to fade, it steps down abruptly: starting at 1/500 of a second for highlights, to 1/250 for midtones, then suddenly, there is a two-stop difference at the next 45 degree angle of the subject. Put another way: north light fades more gradually around the subject than the shadows of south light. The north light shadows present more slowly than the shadows of south light, creeping in with more nuance and character. In contrast, south light has a "steep roll-off." This is why I've been preferring north light for my primarily black-and-white photography: black and white film will reflect these subtle, gradual changes in exposure zones as variations in whites, greys, and blacks. That's why we see a difference to the naked eye, and the final product, when shooting black and white. Now, these were rather crude, low-sample-size measurements, but I'll be getting into more detail about the behavior of north light and how it interacts with each film's unique characteristic curve at our upcoming LB workshops this summer and fall. We'll also be talking about why my friend Sandra Coan here at Little Bellows much prefers south light to north light for her beautiful color photography! The reason will blow your mind! A few weeks ago I woke to this email in my inbox: "I would really love to learn to shoot with strobes, but I mostly work in client's homes. For on-location photography, are you hauling a lot of lights and gear? Is shooting with strobes more applicable to working in a studio set up? Or is it something I can take with me when on the go?" Well, it just so happened that I had a shoot in a client's home the same day I received the email. So I decided to document shooting with strobes on location and share just how easy it is to take your lights with you. The image below shows everything I take with me when I'm going on location. I have a medium (5 foot) OctoDome (and speed ring), an Alien Bee 1600 (and power cord), light stand, radio trigger and receiver, light meter, Contax 645 and film. Here is the Alien Bee, Contax, light meter, film, trigger and receiver and power cord in my camera bag. As you can see, I have room to spare! And here is my camera bag, OctoDome and light stand, all packed and ready to go. I was able to carry all of this (along with my Americano) to the car in one trip, no problem! Once I got to my clients house, I went to the room we were planning on shooting in and took a meter reading. Despite the huge north facing window, it was pretty dark! Shooting at 400, I was getting a reading of F2 1/15, way to slow for working with a baby and a four year old! So I set up my light... it took me less than five minutes. 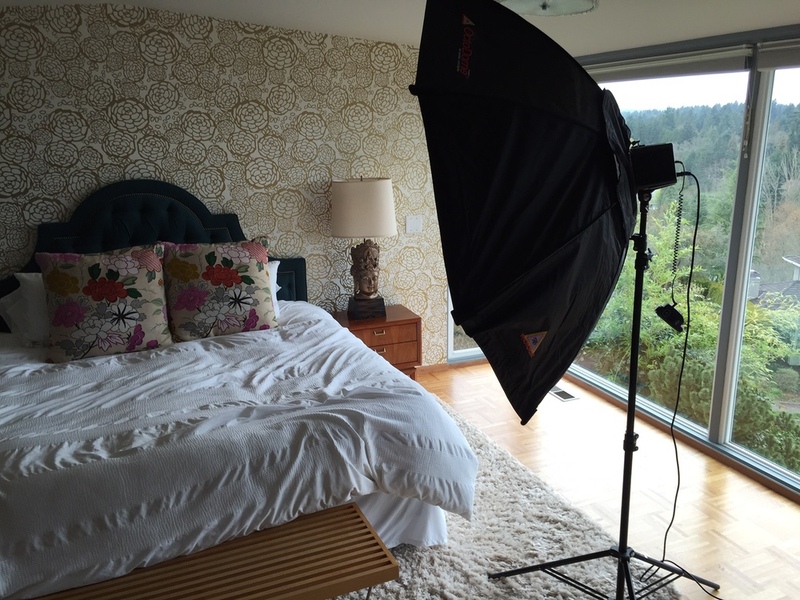 With the light set at a 45 degree angle to the bed, I was able to move around and shoot from different angles. Here are the results... beautiful, luminous images!! So glad I brought the strobe!! Questions about shooting strobes on location? Please ask! I'd love to help. And to learn all about shooting strobes visit this page to get newsletter list. That way, you'll be the first to know when the new guide is released! Jen Golay: Rockin' the Strobes! Last Thursday I wrote about the agonizing wait we film photographers endure after we've shot our film and sent it into the lab. It can be maddening! I expect this now when I shoot for myself, but I didn't expect to feel it so intensely for others. The Missing Link, The Film Photographer's Guide to Studio Strobes has been on the market now for two weeks. And in that time, I know many who have bought the guide, shot a few roll with strobes, and are now waiting for their scans to come in. Well, I've been waiting too. I've wanted to see their results. And, as I'm not a patient person by nature, it has been hard! So yesterday when I was notified that Jen Golay had tagged me in a post about scans on Facebook, I stopped what I was doing and ran to the computer to see. And holy moly, did Jen rock it! "I used strobes before, but not with confidence or intention, more like a wing and a prayer. But because I had experience with strobes, it was very hard to decide whether to spend the money on something that I wasn't sure would teach me anything new. I ultimately decided to take the plunge and buy the guide because I loved the idea of having a community of other film & strobe shooters in the Facebook group. ", said Jen. "The Missing Link really was my missing link. For me, the most valuable part of the guide was learning to meter strobes correctly. I have always metered color film and black and white film the same way. It was very revolutionary for me to try metering differently for different films. What I love about this knowledge is that it makes sense and is repeatable. I can now shoot with intention and know what I'm going to get instead of shooting and hoping it will come out as I imagine." "The other cool thing about The Missing Link is that it works with natural light. I used the metering technique with Tri-X and window light and finally achieved a look I've been trying to master for the last four months!" Yeah!!! Stunning!! Way to go Jen! Do you want to learn about shooting film with strobes? Sign up for my newsletter today and be the first to know when the new guide is released! The Missing Link: A Film Photographer's Guide to Studio Lighting | Learn how to use strobes and speedlite flashes with your film cameras!